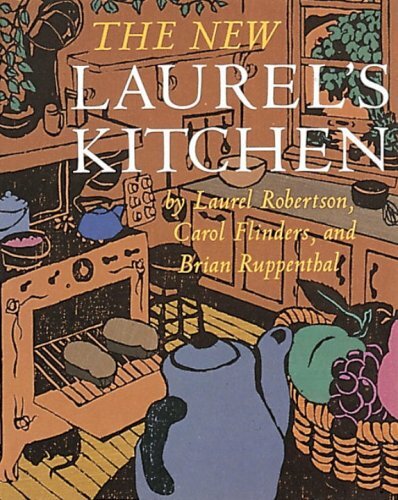 The New Laurel's Kitchen includes plenty of simple, beat-the-clock recipes - who doesn't need them? But it refuses to blur the distinction between natural foods and fast foods. If you need forty-five minutes to bake a potato or cook brown rice, fine. That's good, solid wind-down time, precious in today's hurried world: time to cut up green beans, or prepare a cauliflower curry; time for the children to dry the lettuce and help make an Appley Bread Pudding. Laurel's kitchen has its own pace - a human pace, that lets other things happen besides just dinner. Good health is the first concern here, and foods that support it are rendered irresistible: dishes like Mushrooms Petaluma, Poppyseed Noodles, Lazy Pirogi, and Sebastapol Pizza. These are well-tested and innately manageable recipes, homespun, but with a generous splash of the sophistication that has swept the food world in recent years.